Gangs are such a part of life in southeastern Los Angeles that Daniel Gonzalez once thought he was destined to be wrapped up in them sooner or later. The omens were everywhere. He had friends die after they were stabbed in a racially motivated fight. Almost every day, he hears gunshots and police sirens around the neighborhood. "Of course it scared me," says Daniel, 17, whose parents are Guatemalan and Salvadoran. "I would never want to live that life." But something rescued him from that nightmare: classical music. At age 12, Daniel began taking classes at the Youth Orchestra of Los Angeles, a program run by the Los Angeles Philharmonic, the nonprofit group Harmony Project and the city's EXPO Center. Now he's a French-horn player who has performed onstage at the Hollywood Bowl and Walt Disney Concert Hall with the likes of Stevie Wonder. He says the program gave him structure and a love for music that have helped him get on the right path in life. He had a short internship in the offices of the L.A. Philharmonic and is now applying for college scholarships with a goal to become a family doctor. "When I came here, it just felt like a relief, like a sanctuary," Daniel says. "This program has really changed lives, because it gives kids something to do instead of getting into trouble." The initiative  called YOLA for short  was inspired by a Venezuelan program known as El Sistema, which has taught classical music to hundreds of thousands of underprivileged children for more than three decades. El Sistema's most famous product is L.A. Phil director Gustavo Dudamel. When the Venezuelan took over the orchestra in 2009, he began to replicate El Sistema and got the L.A. Phil to invest in YOLA. The program now offers instruction as often as four days a week to some 500 underprivileged kids (most of them Latino or African American) in underserved areas of the city. Children who want to learn to play classical music usually have to pay a lot of money for lessons and instruments; YOLA provides both for free. Recently, the L.A. Phil announced a new project called Take a Stand that will set up a master's program to educate instructors on the El Sistema model for teaching kids. I first visited the El Sistema program six years ago, when I was a reporter in Caracas. At concerts, teenagers glowed about the performances of certain pianists or violinists in the same way American children might be passionate about a rock band or a football superstar. Kids from poor backgrounds were able to use music to direct themselves toward greater opportunities. I remember meeting one young musician who by age 17 had been to correctional facilities nine times for drug use and armed robbery. With the help of El Sistema, within six years he was earning a living at a music institute and had played a dozen times at Venezuela's most famed concert hall. He was even studying to perform Mozart's Clarinet Concerto. Visiting YOLA, I was curious to see whether the successes in Caracas could be replicated in the U.S. The Los Angeles program is in its infancy, and there have been challenges tailoring the Venezuelan model to the U.S. While efforts to mirror El Sistema have also sprouted up in other cities across the U.S., the program is easier to implement in Venezuela because it is financed by the government and decisions are made by a central administration. In contrast, the New England Conservatory said in 2011 it wouldn't fund the expansion of a nascent program called El Sistema USA. But there are positive similarities to the Venezuelan program. The sounds of clarinet, flute and trumpet classes floated through the halls of one of the program's two main centers. Children learning the flute practiced their posture and B-flat-major scales, while clarinet students rehearsed parts of Rossini's Barber of Seville. In an upstairs office, a few advanced students talked with teachers about their game plan for an upcoming performance of Mozart's Eine kleine Nachtmusik at a local talent show. One of those students, a 13-year-old flautist named Malonie Penn, told me with a smile that she listens to Mahler's Symphony No. 1 at home even though her parents don't care for it. The program teaches children not just music but also responsibility and how to be models in their community. In a hallway, Maria Morales and Josefina Martinez, both natives of Mexico, waited for their children to finish class. Morales said that instead of hanging out on the streets or becoming pregnant at an early age  which she said many girls in the neighborhood risk doing  her 13-year-old daughter Kasandra wants to grow up to be like her cello teacher. Music class also helped teach Kasandra the discipline she needed to overcome difficulties she was having with math class in school. "She has models to follow," Morales told me. "The teachers have been a big support for her in her adolescence." Martinez chimed in, saying the program helps keeps kids away from the violence in the area. "There are gangs where we live," said Martinez, whose 11-year-old son plays clarinet. "So now our children can make friends with kids who are musicians and not street kids." Word of the program is spreading so fast that staff can't keep up with the demand. As I spoke with program manager Paloma Ramos, a mother arrived to inquire about her daughter's joining the program for violin instruction, and Ramos told her new applicants were being put on a waiting list. After the woman left, Ramos pointed to an empty file folder and said it had held a thick stack of applications only days ago. Demand is high partly because YOLA offers what many public schools can't  amid budget cuts, many don't have programs to teach string instruments, and those that do usually won't offer more exotic instruments like double basses or double reeds. YOLA is also sought after because children find a caring staff that offers moral support and helps kids traverse the turbulent teenage years. Ramos, for example, not only helps students flourish as musicians but also gives them feedback on the essays they write for their college applications. That's a huge asset, especially for children who come from broken homes. "This type of prolonged contact with the program allows us to help them become not only good musicians but good human beings," says Ramos, who is also a violinist. 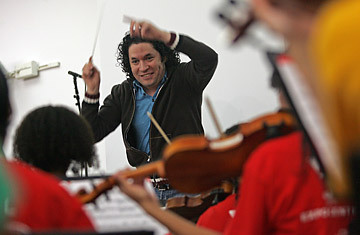 Of course, another huge plus for the students is that some of them get to play with Dudamel. Sharing a stage with the passionate Venezuelan would be a huge honor for any musician. He's had praise lavished on him by the most legendary of conductors, and he's largely considered the hottest ticket in all of classical music right now. But these kids don't boast. I asked Penn the flautist what it was like to play with him. "Cool," she said shyly. "He's a cool conductor."